In 2011, Tunisians sparked what become known as the Arab Spring. Young and old, men and women, they flowed into their cities’ streets calling for the end of dictatorship. But in subsequent years the struggle to foster democracy, justice, dignity and freedom has been laced with oppression and rising extremism. Since the start of the Syrian conflict, roughly 6,000 Tunisians—mostly young men but also many women—have left home to join the ranks of Daesh, ranking the country among the highest per capita exporters of extremists in the world. But Tunisia’s youth are also rising to the challenge. 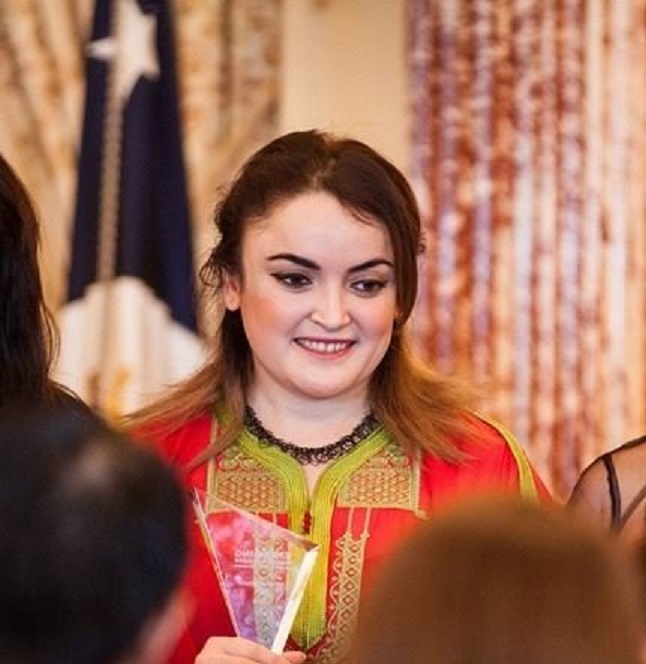 Ahlem Nasraoui, selected as one of the top 10 people working in peace by the U.S. State Department, believes that it is the youth who bear the torchlight for change. The 26-year-old nominee for the United Nations’ intercultural innovation award, spoke with us—and told us us tales of terror, tenacity, imagination and triumph. As young people, I believe we were oblivious before 2011. We did not know what was going on in Tunisia because of the former regime and its corruption, censorship, and silencing of the voices of activists and women. After the 2011 revolution, it became a sort of cacophony, a lot of rising voices and people claiming that they can fix this country. As the Young Leaders Entrepreneurs Association we chose to push for the economic empowerment of young men and women, giving opportunities to those people suffering from unemployment, nepotism, and the long era of rigid censorship and silencing. We believe that spreading entrepreneurship, especially social entrepreneurship, will enable them to not only get revenues to seek services and access opportunities, but gain confidence and security, and not to be victims of brainwashing or extremism. We started many initiatives. One is a mobile school teaching young people, mostly graduates, about the start-up culture, and how to seek opportunities outside their limited bubbles. We encourage them to open up, to travel, and to aspire to succeed and achieve within their communities. We believe in ideas, and we transform them into business plans, not only to make money but to create a social impact. In 2014, we introduced the one billion rising campaign. It is an international movement with more than 200 countries involved. People gather to celebrate women’s rights, and to fight escalation of violence, whether verbal or nonverbal, against women. The movement brought together five thousand men and women in Tunisia. In the most famous avenue in downtown, they danced to “Break the Chain”, and called for the support of women reaching higher positions of decision making. We also started capacity building programs to bridge understanding between different generations, and to encourage the younger generations to participate in the political scene. We spread awareness about voting and being active in the civil society and local governments, and to push for sustainable peace within their communities through social entrepreneurship, activism, and human rights. To me, violent extremism is about spreading fear among people. I remember waking up in horror as my bedroom window exploded because of a terrorist attack close to my family’s house in west Tunisia. This is something new to us, to our country which is known for safety and peace but now we started to face such security challenges. So, for me and my community, extremism is a challenge for democracy, peace values, and the country as a whole. Can you share a story about one of the activities that was particularly successful? Fighting extremism is new to Tunisia, but I believe that radicalization was happening before the revolution. A lot of attacks happened, but the media was silent about them. After the revolution the issues surfaced, and we started to face the social, economic and political diseases that were hidden and have become visible. I come from a remote area in Tunisia, and I have worked face to face with people related to ex-fighters or those who have gone to fight with ISIS, some of whom were killed. We did not want to push them to talk about it or impose anything on them. We put together strategies such as art, dialogues, and music to create a safe space for them to talk about the trauma. They would discuss how hard it is to have someone in your life fall victim of brainwashing or radicalization. They started to open up and talk. Some were in an emotional crisis. We conveyed the message that it is not their fault that a member of their family has been radicalized. We focused on helping them to consider how they could save the rest of their family and to raise awareness in their community as a form of peer-to-peer education, and to talk about their individual stories and the dangers of radicalization. We also conveyed that violence is not a means of demonstrating masculinity or power. We showed how peace can be more powerful. We also talked about how poverty should not be a route to extremism and getting dragged into this circle of violence. We gave them many alternatives to fight. Forums, painting, dancing and other ways to celebrate life were put on the table. Our approach was also to show how ISIS and other terrorist groups are celebrating death, while we are celebrating life. We want people to choose the right side. We launched a one-year project called Unleash Tunisia Venture Bus. Touring the country, the bus provided a platform for receiving training in different topics skills such as management, social media and marketing. The participants get to know each other and explore each other’s regions, delve into opportunities and the visions they have for Tunisia, and talk about their challenges and best practices to overcome them. Many projects came out of the Bus, ranging from recycling programs to ecological tourism, fashion, and platforms for connecting youth and decision-makers, craftsmanship, as well as means of enabling personal development and digital innovation. Through the ‘Unleash Tunisia’ program we enable young people to bridge what they have learned at schools and the market realities and skills they need, for instance networking, public speaking skills, creating professional CVs and cover letters amidst Tunisia high rate of unemployment. Some learned about job hunting techniques. Fresh graduates from almost 20 governorates in Tunisia from the north to south took part in five tours covering the entire country, and we made sure they all met at the closing ceremony. Our work has helped bring up the regional debates over issues like peace, extremism, and radicalization by combining the social and economic approaches. This is central to our theory of change as we believe in building bridges between the public and private sectors so we get the best of both worlds and a shared larger picture of the future we collectively aspire towards. In your opinion, what is missing from current approaches to defeating violet extremism and radicalization? I work with youth and for youth. If someone would make an educational curriculum which deals with security, like the kind of topics discussed at ICAN’s forums, I want them to be adapted and transferred to the community. Normal awareness campaigns are okay, but I want something deeper with more knowledge—knowledge of the communication and manipulation tools used by extremist groups, security challenges, and bridging gaps to governmental agencies like the Ministry of Defense and the Interior Ministry. We want people to be in touch with those on the front lines who are taking action such as military tactics and field work against ISIS. I have an idea to invite officials to talk to young people, even kids, about their struggles. It is really important to create empathy within the communities and to support each other. Academic research and on ground work should not be separate from each other. It should be complementary work to unite our powers and defeat them. How does the International Civil Society Network (ICAN) help with your work?